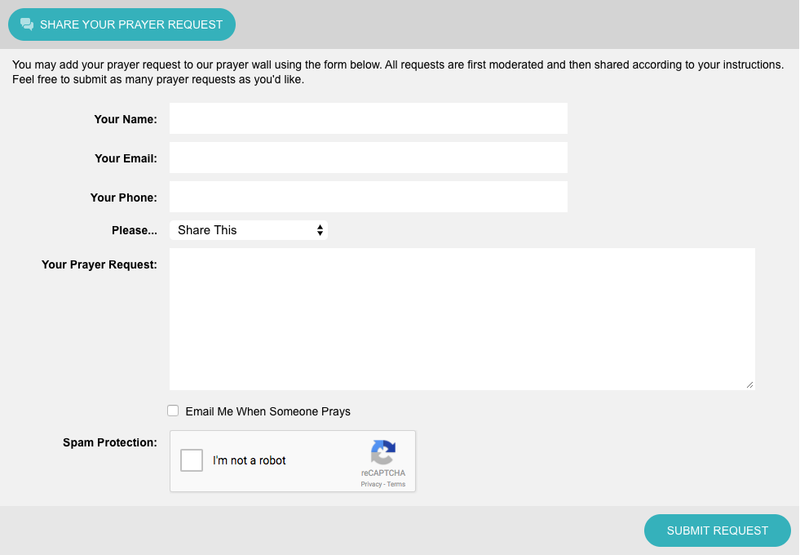 Deep River’s new prayer request system is here. You’ll like it. Members and attenders of Deep River Friends Meeting can now submit prayer requests online at deepriverfriends.com/prayer. Click the “SHARE YOUR PRAYER REQUEST” button and fill out the form. The requestor will add their name, email address and phone number. The email address and phone number will not be posted publicly. Requestors will also have the option to submit their request anonymously. There is a dropdown menu that begins with “Please…” – there are three options here. Please… SHARE THIS – the request will be shared online using the requestor’s name. Please… DO NOT SHARE THIS – the request will not be shared online, but with staff members at Deep River. Enter the prayer request in the “Your Prayer Request” text area. Visitors to this page can pray for individual requests and click a “I Prayed For This” button to let requestors know their requests have been prayed for. 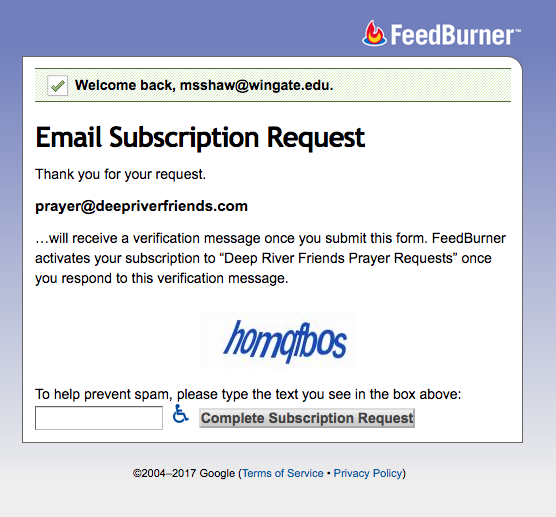 If you’d like to receive an email when your request has been prayed for, check the “Email Me When Someone Prays” box. Finally, check the “I’m not a robot” box to let us know you’re not trying to spam our website. Click “SUBMIT REQUEST” and you’re done! Each request is moderated by staff at Deep River before appearing online. If you need to delete or make any changes to the request, please email prayer@deepriverfriends.com and let us know what you’d like us to change. Want to receive a daily email with the latest prayer requests from Deep River? That’s simple. What you’ll get: You will receive one email per day, between 11 a.m. and 1 p.m. You will only receive an email if a new prayer request has been submitted and approved. If there are no new requests, you won’t get an email. It really is that simple. At the bottom of the Prayer page, you can enter your email address to subscribe to updates. Once you click “subscribe” you’ll be redirected to a FeedBurner webpage. This is to help prevent spam. Enter in the text you see and click “Complete Subscription Request.” The page will tell you to check your email inbox to see a verification email. In that email, there is a verification link you must click to enroll in email subscriptions. Click it and you’re done! If you have questions, please email Mike at prayer@deepriverfriends.com.